WASHINGTON (CNN) - President Donald Trump said Thursday his administration will impose tariffs on steel and aluminum imports as early as next week, a highly controversial move that Trump framed along economic and national security lines. Trump said the US will impose a 25% tariff on steel imports and 10% tariff on aluminum to shore up the struggling industries, capping a fierce, months-long internal debate that divided some of the President's top advisers. 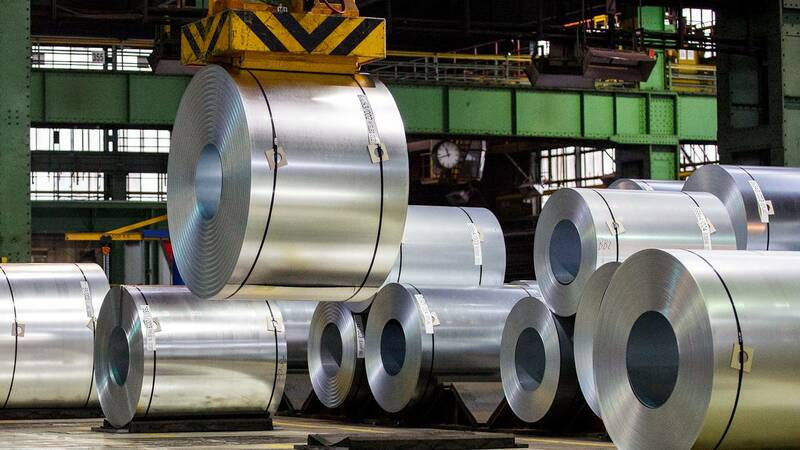 The move is likely to invite retaliatory measures from foreign countries, raising the specter of a trade war between the US and several other steel-producing countries. It was not immediately clear whether the tariffs would be phased out over time and whether Trump would follow the advice of his national security advisers and exempt some countries from the tariffs to avoid harming key steel-producing US allies. Trump announced the move during a hastily arranged meeting with steel and aluminum executives, even though the policy he announced is not yet ready to be implemented, let alone fully crafted. He acknowledged the policy is "being written now." "We'll be signing it next week. And you'll have protection for a long time in a while. You'll have to regrow your industries, that's all I'm asking," Trump said. "What's been allowed to go on for decades is disgraceful. It's disgraceful. When it comes to a time where our country can't make aluminum and steel ... you almost don't have much of a country." The tariffs will amount to perhaps the most substantive and wide-reaching trade action Trump has taken to date, making good on another key campaign promise. But the announcement also sent the stock market tumbling, with the Dow taking a 500-point dip in the first hours after the announcement. The plan also drew a stiff rebuke from US manufacturers of products made using steel and aluminum, who maintained that the tariffs could lead to lost jobs in their operations and increased consumer prices. Republican lawmakers urged Trump in recent weeks to reconsider his position, warning him that while the move would boost US steel and aluminum manufacturers, it would lead to increased costs for consumers of those materials and hurt some of the manufacturers he pledged to protect. In a rare break with the White House, House Speaker Paul Ryan's spokesman Doug Andres said Ryan "is hoping the President will consider the unintended consequences of this idea and look at other approaches before moving forward." Republican Sen. Ben Sasse of Nebraska struck a harsh tone, calling protectionism "weak, not strong." "Let's be clear: The President is proposing a massive tax increase on American families," Sasse said in a statement. Trump's announcement on Thursday came after hours of back and forth between White House officials who remained uncertain up until the President uttered the words on Thursday whether he would preview his tariff-imposing plans. The President had told aides on Wednesday to lay the groundwork for him to announce new tariffs on steel and aluminum imports the next day, sending them scrambling to determine what specific policy he could announce and others racing to contact executives and union representatives from the industry to attend the announcement at the White House, multiple sources said. Some of the aides who have been crafting the policy were caught off guard by the plans for an announcement, which The Washington Post first reported Wednesday night. The White House added a last-minute event with Commerce Secretary Wilbur Ross and steel and aluminum industry representatives at the White House on Thursday morning and initially said it would be closed to press, before ultimately inviting in the cameras. Earlier on Wednesday, lawyers in the White House Counsel's Office and the Justice Department's Office of Legal Counsel made clear to policy staffers that they needed more time -- perhaps several more weeks -- to turn the Commerce Department's recommendations into a proclamation that would impose the tariffs Trump has sought to levy on steel and aluminum imports. "Maybe he wants to make an announcement, but the proclamation isn't ready," one White House official said. "Without the proclamation, nothing has legal force." As of mid-morning on Thursday, a White House official said there were no firm plans for an announcement and one White House official said the discussion was going "back and forth" on whether an announcement was feasible. The President, meanwhile, continued to press on via Twitter: "Our Steel and Aluminum industries (and many others) have been decimated by decades of unfair trade and bad policy with countries from around the world. We must not let our country, companies and workers be taken advantage of any longer. We want free, fair and SMART TRADE!" White House press secretary Sarah Sanders pushed back on reporting about the chaotic process, saying "this was something that the President has been talking about for a long time." "It is not a surprise, and we are going to continue doing what we can to protect American workers," she said. It wasn't immediately clear what sparked Trump's sudden desire to make the policy announcement within 24 hours, but his directive for a next-day announcement came as the White House was engulfed in its latest string of negative headlines. On Wednesday alone, one of Trump's longest-serving aides Hope Hicks announced her resignation, his son-in-law Jared Kushner was the subject of several stories raising questions about his foreign and business entanglements and infighting within the West Wing once again seized the spotlight. The tariff announcement would have served as a mild reprieve, sparking off a debate about the merits of a policy that is likely to invite retaliation from other countries. The move was welcomed by the steel and aluminum executives gathered Thursday around a table in the Cabinet Room, who have urged Trump for months to make good on his campaign promise to protect their industries from cheaper foreign imports. "This is vital to the interests of the United States. This is our moment. And it's really important that we get this right," said Dave Burritt, the CEO of the US Steel Corporation. The mad scramble Trump set off on Wednesday was just the latest chaotic chapter in the chaotic policy-making on trade issues that has defined the Trump administration. Trade policy, and the debate over steel and aluminum measures in particular, has been the subject of bitter infighting within the Trump administration. The question of whether to impose the protectionist measures Trump has long favored on steel and aluminum set off a bitter debate between warring factions inside the White House. The debate pitted the National Economic Council director Gary Cohn, Treasury Secretary Steve Mnuchin, national security adviser H.R. McMaster and Defense Secretary James Mattis against the proponents of protectionist trade policies, namely Ross, US Trade Representative Robert Lighthizer and trade adviser Peter Navarro. But in recent weeks it became obvious that Trump was sticking with his original instincts and readying a decision to impose tariffs or quotas on steel and aluminum imports. The departure of Rob Porter, the White House staff secretary who had sought to play a leadership role in trade policy by organizing a weekly meeting on the issue, helped speed up the process to ready the protectionist measures as Lighthizer took over the process, one White House official said. The opposition to the measure was twofold, with the President's economic advisers arguing that the protectionist measures would lead to damaging retaliation from other countries and unsettle global markets. The President's national security and defense advisers warned about harmful impacts on steel-producing US allies. It appeared likely Trump would grant some exemptions as he moved to impose trade duties on the steel and aluminum imports -- but as of Thursday morning, nothing was certain.